The Indian Flexible Packaging and Folding Carton Manufacturers Association (IFCA) was established in the year 1965 which has been pursuing through its multifarious activities to address to the needs of the industry and its members in particular. Promotional efforts of the Association are being aimed to provide opportunities to reflect the industry and create avenues to encourage R& D and related areas. The IFCA over the last few years has also been associated with National and International bodies to integrate its activities better and encourage industry - institutional facilities for information and data development, training, orientation and encourage "work together culture". The IFCA awards have been introduced for excellence in package design - functional and graphics, eco friendly, new materials and technology concepts, and enhancement through packaging adjuncts has helped in raising the innovation and creativity capabilities of the industries. As a national body here the Association has also been addressing to the industrial and fiscal issues faced by the industry. To bring together the whole of the fraternity of the manufacturers of paper, Speciality papers, paper/folding board, films and foil based and allied products. To address to the fiscal and industrial issues faced by the members and represent to the government /departments concerned. Undertake promotional and educational programmes mostly for the betterment of skill of members and the packaging industry in general. Publish magazines and monographs, etc., on the flexible and folding board carton industry. To interact and also to coordinate with national and international counterpart institutions towards mutual benefit and growth. Build up most of the infrastructural facilities for training, data information and provide the interface among the members and industries. To improve f the technical knowledge of all concerned in industry through institutions for study to promote research and training. Demonstration of new techniques and methods. To hold exhibitions, conferences, conventions and to establish museums and libraries. To publish books, magazines, periodicals, also the member's directory and other Literature and to arrange television broadcasts. To conduct research technical and market related studies on various branches of Packaging industry. .
To represent the interests of the packaging industries at central and State Government levels . To institute awards for excellence in Design ,Development and Creativity in packaging. 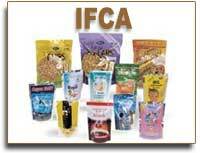 To create and regularly update a website of IFCA to promote the association and its members. Any individual or body engaged in the Manufacturing of paper, paper board, film and foil - based and allied products and owning an operative plant shall be eligible for Membership. Associate members, Affiliate Members and Honorary Members are the different types of membership available. Anti-fungal polycoated stiffner, Aseptic packaging material, BOPP films and Met BOPP films, Brick Pouches, Coextruded film, Coextruded and laminated tubes, Confectionery wrappers, Display packages, Extrusion laminate, FIBC, Folding board cartons, Flexible films, Flexible laminates, Flexography printing, Garment bags, Gravure printing, High barrier films, High barrier laminates, Hotmelt adhesives, Labels, Laminating adhesive, Lined cartons, Packaging solutions, Paperboard, Paper cups, Patent service, Pick up bags, Plastic cartons, Poly roll, Pouches, Printed and Unprinted multilayer films, Printing ink and varnish, Quality control services/ equipments, Shelf ready packages, Shrink sleeves, Specialty packaging, Specialty papers, Spouted pouches, Stand up pouches,. Tube laminate, Vacuum Packaging, VCI papers, Wax coated papers, Woven Sacks, Zipper pouches.